Are small cap stocks better than large cap stocks? We talk numbers with expert two traders. So, while everyone’s talking about the large cap S&P 500 index hitting record highs, there’s another index that’s hitting record highs, too: the small cap Russell 2000, which broke the 1000 level this past Friday. And, the Russell 2000 is sweeping the S&P 500 in returns any way you slice it. With more global economic uncertainty, Cortes thinks the mostly American-based revenues of small cap stocks will serve as a safe harbor for their investors. But do the charts back up the fundamental argument? 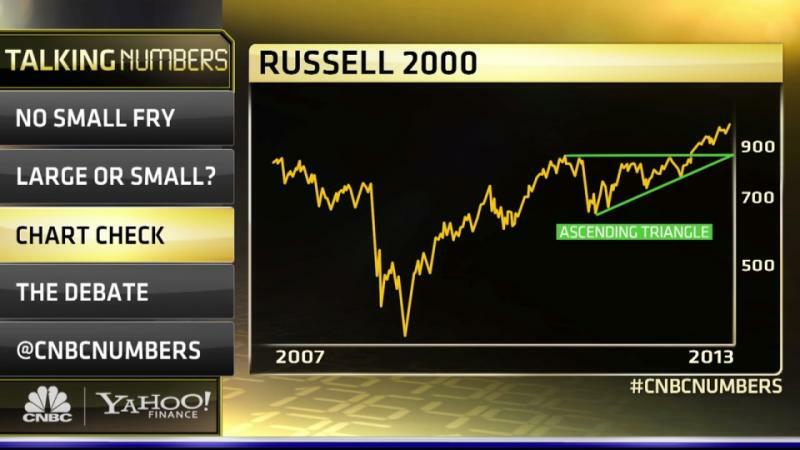 Talking Numbers contributor Richard Ross, Global Technical Strategist at Auerbach Grayson takes a look at the Russell 2000’s charts. To see Ross’ chart on the Russell 2000 and to hear more of Cortes’ analysis, watch the video above and decide for yourself if small caps are the way to go.